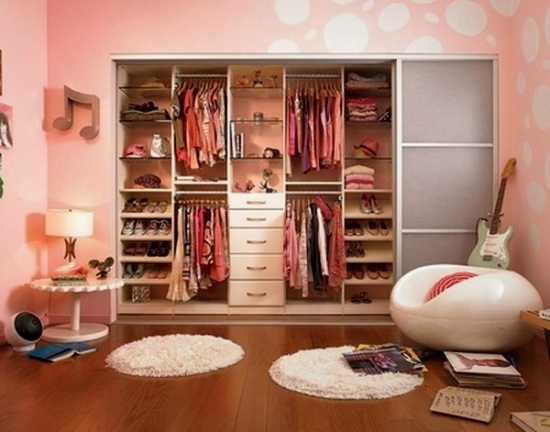 Closets are decidedly an underrated part of regular interior design. Closets tend to be located in the private zones of your home, and therefore used to be considered ‘low-priorities’ when it came to designing. Contemporary times call for a different lifestyle though, and closet design has become just as important as any other part of the home. With modern design techniques, we now have a wide variety of options on designing the perfect closet ideas for any home, and further, we will be taking a look at quite a few. A simple walk in closet is gender neutral – it can be for women, just as it can be for men. It can also be for both at once. It all depends on how you separate the two parts – by clothes, or by design. This dichotomous closet idea is one of the more popular ones – especially for married couples. A walk-in closet for women is a completely different design entity on its own. The space needs to be parsed out according to the specific dimensions of women’s clothing and accessories, and the design can lean in the so-called ‘girly’ direction. This one is especially for people who are inspired to ‘collect’ items – be it clothing, shoes or accessories. Spanning the size of a small room, the bedroom sized closet is spacious and well-organized – with specifically designed compartments for each and every article in the closet. We live in an era where space constraints have led to small apartment living. 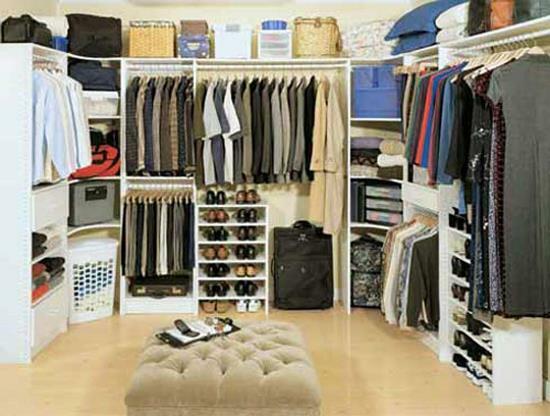 So if you cannot have a full-sized walk-in, you can definitely have a small compact closet. This one is designed like a large wardrobe/cupboard. It has various shelves and hooks/hangers for neat organization – perfect for a sweet, humble abode. We’ve seen some variations of the room sized closet, but this one takes it a step further. The trend setter closet will most definitely be owned by a fashionista, and will come with full length mirrors, fashionable wardrobe designs, a compact seating space, dresser and maybe even a chandelier. A shoe lover’s dream come true, his may, or may not be a part of the walk-in closet. The full-length shoe rack closet will boast a separate section for shoes, all organized in neatly designed racks. 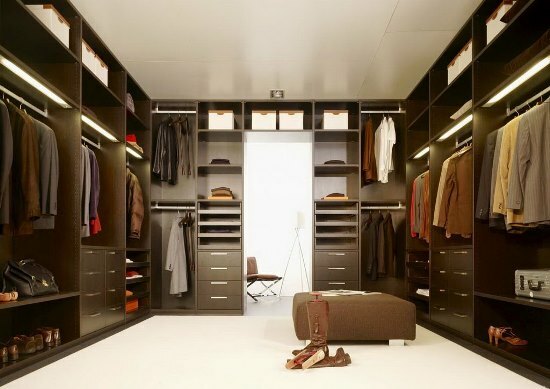 The men’s closet is of course designed according to the dimensions of men’s clothing and shoes. It also comes with a more masculine color scheme. The materials are lighting always reinforce a rather rugged and male-oriented ambiance. It may not be possible to own your very own luxury boutique, but having a boutique style closet in your home is as far as you can go. 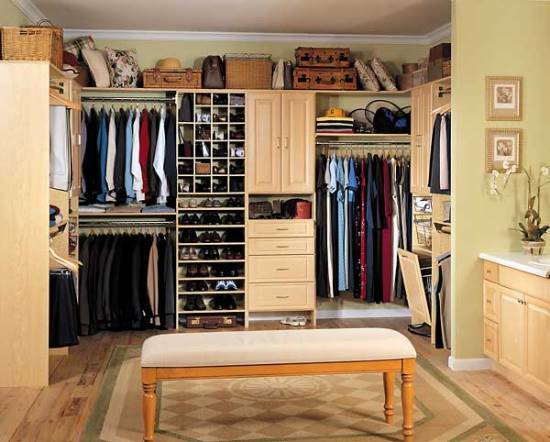 If your tastes run the gamut of luxurious, then this closet would definitely be your preference. With wide spaces, large storage areas and sumptuous materials, this one will definitely reinforce splendor. Note that the interior décor would be different depending on the gender of the child, but the overall construction remains the same. The children’s closet is more a doll-house arrangement of all their clothes, shoes and toys in a fun, alluring way. This one is designed in the image of an old school media wall. 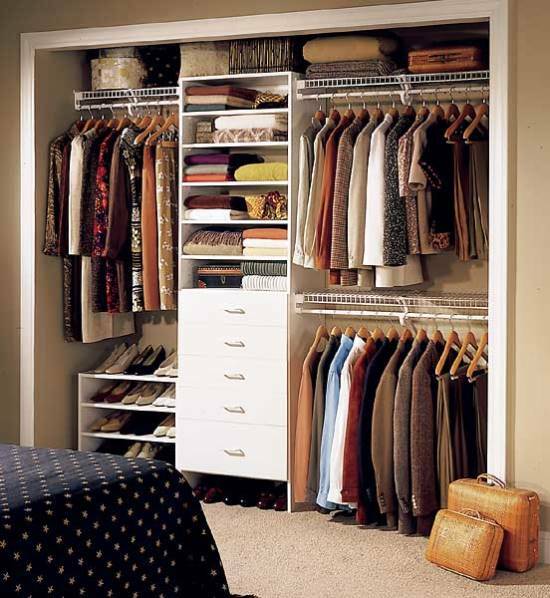 It is certainly compact in design, but comes with enough racks to properly organize all of your closet items. Talk about swanky strip lights and frosted glass, all in the display of your closet and you’ve got the contemporary closet design. This one is designed in the vein of retail displays and is a bit more affluent than the other types of closets. This contemporary closet is more often than not, a part of the walk-in closet set. The dark wooden closet cabinets against the white glossy floor exudes a classy and sophisticated look. This closet design is especially perfect for those who belong to the industrial class and believe in keeping their things extremely organized. 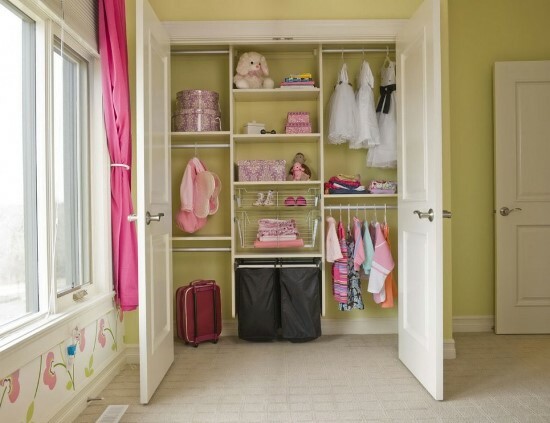 This small bedroom sized closet is just the right choice for young girls. Sumptuous space for closet organization, the little lamp table and the puffed sitting stool makes the closet a comfortable zone for girls. This hang clothes closet design is perfect for preserving the clothes in a good condition. Further, the differently sized boxed shelves provide space for storing other accessories and valuables. The white closet frame set up against the peach colored wall is perfectly in sync with the surrounding room decor. Spacious enough, this design is perfect for little girls and helps them with closet organization. 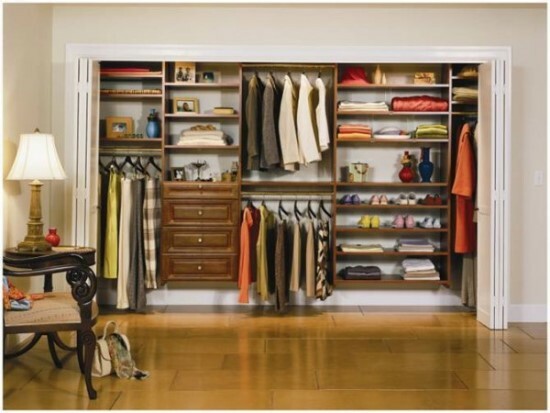 This contemporary walk-in closet design sets quite a luxurious picture in one’s home. Neatly designed for every item of clothing or accessory that you might be owning, this will definitely help in closet organization. This closet with a modern interior décor is a great space for men. 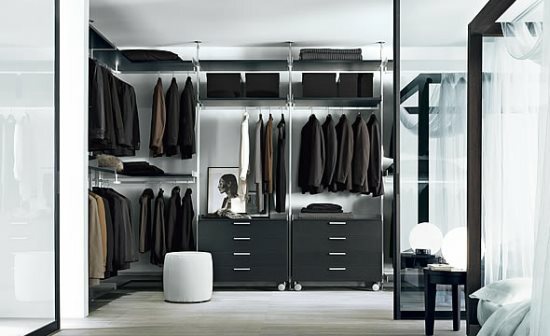 The masculine touch to the closet adds to its appeal along with allowing men to stay organized in their closet. 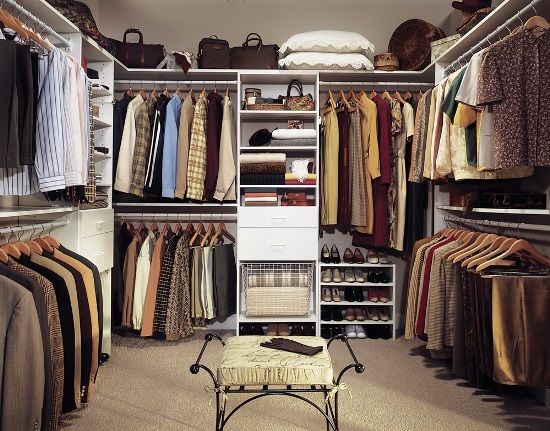 We hope this articles helps you in your pursuit of a better closet design. Now that you know just how many unconventional closet ideas are out there, you can always mix and match the different ideas to create your very own closet style. 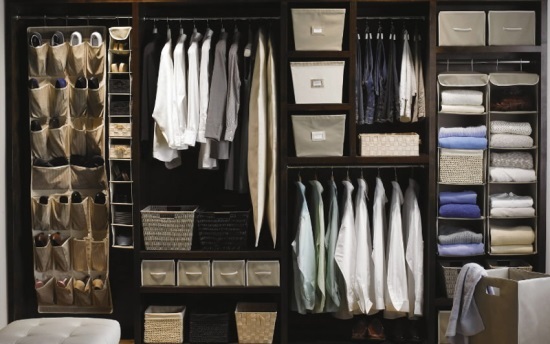 Organizing your closet is more important than just building a luxury one and through everything here and there. 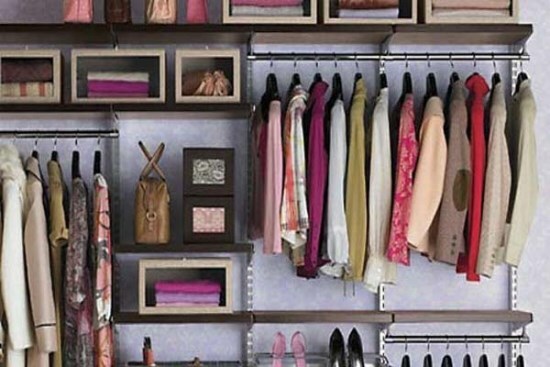 A simple but well organize closet look more elegant.